Make an impact in standout checks. 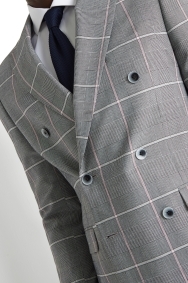 Double-breasted fastening, peak lapels, and large white and pink checks come together to make this jacket a true statement piece. 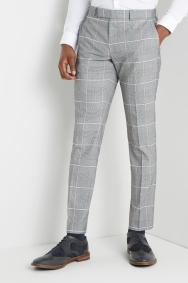 Featuring a slim fit that nips in at the waist and provides the sharpest of profiles, you’ll have no problem making your mark in the office or at a wedding. 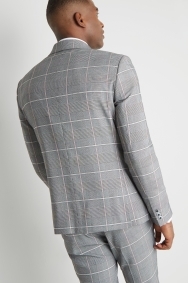 Build on this jacket’s bold character by opting for a shirt with double cuffs, sticking with plain white if you want to draw more attention to the check pattern. Great fitting suit. Ordered of the website so was worried about the fit but by using the sizes on my other Moss Bros suits it is perfect. Looks great. I bought on a whim as a summer suit, it will serve my purposes perfectly. 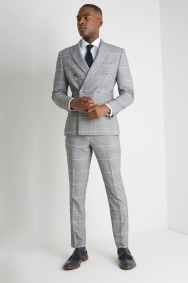 Love the style and look of the suit, it's not your everyday look. 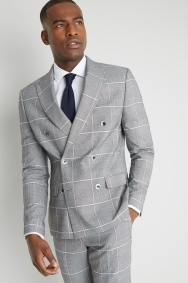 Moss Bros always seem to have that something different that I'm looking for.